Sightings of a mystery object in the skies above Wiltshire 50 years ago have been immortalised in a mural. The reports of the UFO, known as "The Warminster Thing", came from many people who heard mysterious sounds and saw objects in the night sky in 1965. The mural, by a "secret" artist, was organised by the Warminster Information Centre which said the "utterly unique event" should not be forgotten. The artwork is on the old police station wall by the information centre. George Rich, from the Warminster Information Centre, said: "[The mural] has attracted lots of attention. People are already taking lots of pictures. "And that's what we want them all to do, come along and stand in the beam, do selfies and get it all on Facebook." 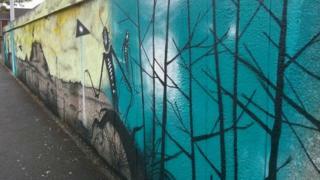 Leslie Blain, also from the information centre, said it had taken eight months to plan and organise the mural. She said: "It's a secret as to who actually did the painting. He said it's still not finished, so you might be able to catch him in action. "He said he's going to add some other elements. There is going to be some glow-in-the-dark paint. So over the day when it's sunny, the wall will heat up and at night time the picture will glow." Photographs of Warminster's "flying saucers" appeared in national and local newspapers at the time, giving the town much publicity. A public meeting was held over the 1965 August bank holiday after thousands of people visited Warminster to try to see UFOs for themselves.